Some of the events and happenings under KPP which have led to significant progress under the workstream or study are listed in this section as 'Achievements'. Kenyan women have been urged by their Indian counterparts to take advantage of business opportunities coming their way. 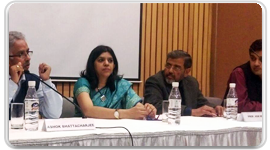 SafetiPin, in partnership with IPE Global and supported by Government of UK’s Department for International Development (DFID) under its Knowledge Partnership Programme (KPP) conducted a workshop on “Using Data to Build Safer Cities” on the 9th February, 2016 at the India International Centre, Delhi. The dissemination workshop was attended by approximately 40 professionals from various organizations engaged in Urban Research and Urban Infrastructure. Along with presentation on the Safetipin app and data, the workshop included a panel discussion on “Integrating Safety in Smart Cities”. The esteemed panel comprised of Mr. Ashok Bhattacharjee, Centre for Science and Environment; Ms. NanditaBhatla, International Centre for Research on Women; Prof. A.G.K. Menon, INTACH; and Mr. Amit Bhatt, World Resources Institute. A book release function and panel discussion on the book titled “ TPP and India: Implications of Mega Regionals for Developing countries” edited by Dr. Harsha Vardhana Singh was organised by IPE Global Ltd, IISD, Geneva and DFID India in collaboration with CII, New Delhi on 1st February in New Delhi. Under the KPP project, the Indian Institute of Productivity (IIP) is engaging with stakeholders in Bangladesh to facilitate efficiency in resource use and resource conservation in small and medium enterprises which are effective vehicles of employment and poverty alleviation. 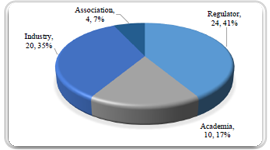 The textile and brick sectors are two such sectors that employ large number of people and add to the GDP. Processes used in these SMEs offer great potential for reducing resource use. Over the past few months, consistent engagement with the manufacturers, experts, academic institutions and government have enabled exposure to technologies and processes that are used in India. As part of the knowledge transfer process and its institutionalisation in policy to upscale practice, three policy papers have been prepared to support the Bangladesh government. 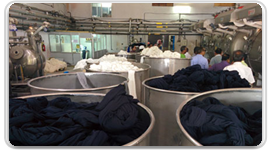 Based on developments in India, the policy paper Promoting zero liquid discharge mandate for the Bangladesh textile industry highlights the roadmap, benefits and challenges in implementing a successful ZLD programme in the textile sector. It also suggests a possible approach for the country to roll out a successful ZLD programme. 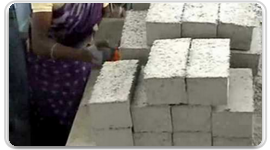 The policy paper Promoting resource efficient Brick making in Bangladesh informs on the use of fly ash in brick making. It highlights the technical aspect of FaL-G, the benefits as well as challenges in introducing FaL-G technology in the country, the guiding principles for framing meaningful policies for promoting adoption of FaL-G technology. These suggestions are based on Indian experience and policy measures. Based on experiences from India, the policy paper Promoting Energy Efficiency in the Industry Sector in Bangladesh highlights the guiding principles for framing meaningful energy efficiency policies and programmes that have climate mitigation co-benefits. The paper also highlights a possible approach that Bangladesh can follow while implementing energy efficient and conservation measures. 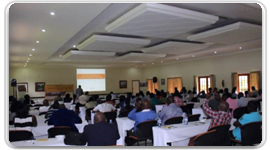 After a successful pilot on setting up a Vertical Shaft Brick Kiln in Malawi, a workshop to share green construction technologies amongst potential entrepreneurs and other stakeholders was held in Malawi in November 2015 that attracted more than 80 participants. 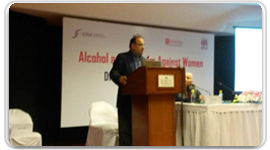 ICRW (International Center for Research on Women) in partnership with IPE Global, supported by Government of UK’s Department for International Development (DFID) under its Knowledge Partnership Programme (KPP) held a dissemination workshop on the final study findings of the project ‘Analytic Study on Alcohol and Violence against Women in India’ on December 14, 2015, New Delhi. The Kudumbashree- Ethiopia scoping exercise to pilot the Kudumbashree model of SHGs in Ethiopia is a project supported by Government of UK’s Department for International Development (DFID) under its Knowledge Partnership Programme (KPP) implemented by IPE Global. 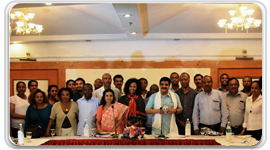 An 8-member delegation from Kudumbashree, Kerala conducted a scoping exercise to identify the existing structures and practices and exploring the potential of adapting Kudumbashree model to the context in Ethiopia from 15th November to 03rd December, 2015. The pharmaceuticals sector in India is currently open for 100% Foreign Direct Investment (FDI) in both Greenfield (Initiation of new venture and facilities) and Brownfield (Purchasing of an existing facility to begin new production) investments. Mergers and Acquisitions (M&A) can act as a source of capital, productivity and innovation but can potentially jeopardize the capability of Indian pharmaceutical industry in relation to ‘Access to Medicines’, which is one of the major goals of the health system. While Kenya has the right to food enshrined in its Constitution, translating this right through laws, policies and programmes has still to take place. 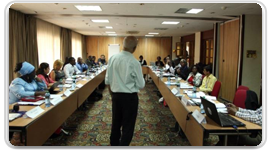 Participants from Kenya were invited to a workshop to learn from the Indian efforts around social protection and food security. This publication provides an overview on the main issues debated during the development and passage of the India’s National Food Security Act (2013), which legally binds national and state governments to extend far-reaching social protection to the country’s population. It raises many lively and pertinent debates that may be useful for policy-makers and advocates, especially in low-income countries but also emerging economies, who wish to strengthen the programmatic and legal frameworks for food and nutrition in their respective countries. 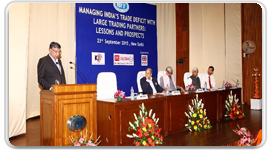 A one day seminar on “Managing India’s trade Deficit with major trading Partners: Lessons and Prospects” was organized by Indian Institute of Foreign Trade in partnership with the Knowledge Partnership Programme of IPE Global Ltd and DFID India on 23rd September 2015 in New Delhi with an objective to disseminate the study findings and provide a set-of policies to reduce India’s trade deficit. Delivering the welcome address, Mr. Sunil Mitra, Team Leader Knowledge Partnership Programme (KPP) pointed out that India’s trade deficit with China, South Korea and Indonesia has reached around $70 billion in 2014-15 and together these three countries accounted for more than 45 per cent of India’s overall trade deficit. ICRIER’s working paper titled ‘Administrative Structure and Functions of Drug Regulatory Authorities in India’ states Drug Regulation has been the focus of several recent policy reform efforts in India, starting with the Mashelkar Committee Report in 2003 to the most recent report of the Ranjit Roy Chaudhary Committee in 2013. Nevertheless, the regulatory structure continues to be plagued with several structural challenges, including issues related to regulatory harmonisation between the centre and the states, access to regulatory resources, transparency, which have undermined the general effectiveness of the regulatory system. Through legal and policy analysis, supported by stakeholder interactions, this study not only provides a systematic analysis of the current challenges, along with actionable policy recommendations and suggests possible means for their operationalisation. Review and technical comments have been provided by Dr.Dinesh Agarwal, Policy Lead Health and Disease Control, Knowledge Partnership Programme, IPE Global Pvt. Ltd., New Delhi. To accelerate progress on global food security will require every tool in the box. Emerging economies offer a useful range of tools, and a rich seam of recent, relevant experience that developing countries can tap to drive impact on hunger and poverty. This paper explores the value of building new knowledge partnerships between developing and emerging economies, drawing on specific examples from the UK Department for International Development’s recent experience of working with India. The year 2015 may well go down as a landmark year, with the adoption of the Sustainable Development Goals (SDGs) and some agreements at the Conference of Parties (COP) 21. Expectations from both are huge. Knowledge exchange and transfer will be key for achieving the expectations of both. For this, partnerships within and between countries as mentioned in Goal 17 of the SDGs will be imperative. Learning from past experiences and partnerships will help. 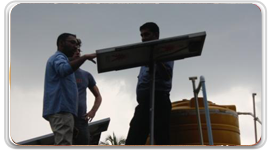 A delegation from the Bangladesh Garments Manufacturers and Exporters Association (BGMEA) visited Chennai and Tirupur in September 2015 to seek comprehensive know-how about effluent treatment practices with Zero Liquid Discharge (ZLD) technology, in order to mitigate ecological degradation caused due to traditional effluent discharge methods. Five members from BGMEA flew down from Dhaka to Chennai to seek guidance on, and demonstration of, effluent discharge practices in the textile hub of Tirupur, India. The purpose was to learn how to arrest the decline in the groundwater tables and increasing water pollution as a result of mass textile production. The new agenda on global development and sustainability comprises of the SDGs along with the means of implementation and the follow up and review framework till 2030. As countries gear up to sign up to the SDGs in September-end, there is a need to develop a widespread understanding on the philosophy behind these goals and develop a strategy to nationalise these goals. RIS with support from UNDP held a consultation on some of the important themes. The Consultation was under the KPP programme. Interactive Session on ‘India’s Development Cooperation with Africa: what Role for Private sector? Half-day seminar on ‘India’s Development Cooperation with Africa: What role for Private Sector?’ was organized by Confederation of Indian Industry (CII) in partnership with IPE Global under its Knowledge Partnership Programme support by DFID on September 2 2015 at CII Central office, New Delhi with the aim to disseminate the study findings and to initiate a discussion on how alignment of India's development cooperation and private sector priorities would contribute to poverty reduction and economic growth in Africa. Delivering the welcome address, Mr Sunil Mitra, Team Leader, Knowledge Partnership Programme (KPP) noted that the private sector has become an important partner in development cooperation and recognised by both traditional donors and South-South assistance providers. The article informs about the gradual transition from the traditional clay bricks to mainstreaming FAL-G bricks (FlyAsh Lime-Gypsum) in India. It discusses the scope of uptake of this technology in Bangladesh, as an option that avoids the use of top soil used for conventional brick making. It informs on the challenges for making this shift and outlines options for addressing these. The suggestions are based on an ongoing project involving stakeholders from Bangladesh and India. 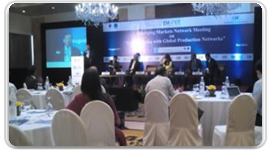 The Confederation of Indian Industry (CII) in partnership with OECD Emerging Markets Network Meeting organized a conclave on “Linking India with Global Production Networks” on 5th August 2015 in New Delhi. The objective of the business meeting was to analyse and discuss the challenges and opportunities to make India a global manufacturing Hub. The conference brought together approximately 100 participants including government officials, international agencies, academicians and industry chambers. Moderating the inaugural session, Deep Kapuria Chairman, CII Trade Fairs Council, emphasized on developing an ecosystem, R&D and linking services sector with manufacturing sector for capturing greater value in GVCs. The Knowledge Partnership Programme (KPP) has facilitated mutual sharing and exchange of development solutions through knowledge, experience, technology, investment, information to explore and showcase India's success in meeting development challenges in terms of policy and practice. 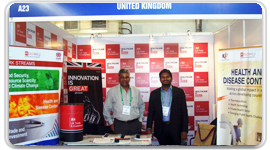 The Programme, through its various initiatives has furthered collaboration around ideas, knowledge, evidence, accountability, technology and innovation between UK, India and the developing countries of Sub Saharan Africa and South East Asia and has so far connected India with 43 developing countries. The pilot VSBK kiln set up with technical collaboration from DA/TARA has crossed the one million mark and is a major step in Malawi’s efforts to address deforestation, cater to improved housing demand and develop entrepreneurship . 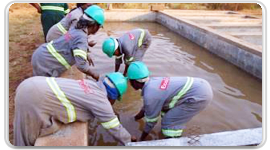 The added value has been the increasing employment of women in the entire process and the increased wages provided to the workers. July 2015 was in a sense historical for Malawi. An attempt to address deforestation taking place due to brick production showed promising results. 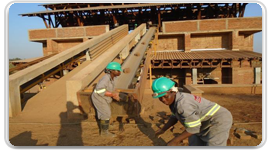 The efforts put in by Development Alternatives/ TARA for technology transfer from India to Malawi bore fruit as the number of bricks produced in the pilot kiln crossed the one million mark and began to be used in construction. The kiln was inaugurated in January this year. 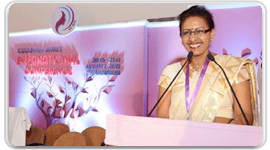 An international conference organised by Kudumbashree, the State Poverty Eradication Mission of Kerala focusing on how the model and similar development initiatives led by women had transformed the development debate by transforming these women from “targets” to “subjects” of the growth paradigm. Keeping this in focus, Kudumbashree, the State Poverty Eradication Mission, Government of Kerala organised its first International Conference on "Poverty Eradication, Women's Empowerment and Local Self-governments" on August 20-21, 2015 in Thiruvananthapuram, Kerala. 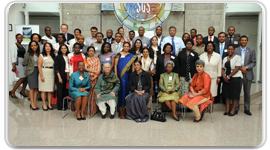 June 28, 29 2015 witnessed the coming together of more than 60 participants from West African countries for the second Global Dialogue on ‘Global Dialogue On Food Security And Nutrition Security: Sharing Experiences From India And Brazil To Develop National Frameworks’. An ambitious project, Global Dialogues is led by the Centre for Equity Studies (CES), New Delhi with DFID support under the Knowledge Partnership Programme (KPP). The workshop drew participants from the 11 countries of Benin, Burkina Faso, Cote d’Iviore, Democratic Republic of Congo, Ghana, Kenya, Mali, Nigeria, Senegal, Sierra Leone and Togo. Representatives included those from the government, farmers groups and activists. Analytical study on Alcohol use and Violence against Women. • To understand the relationship between alcohol policies and prevalence of VAW. • Recommend policy changes where required. 1. The economics of alcohol policy at state level; the revenue from the sector, and its influence on policy. 2. The wider social cost and impact of alcohol and alcohol policy, particularly on women and girls, and on violence, including VAW. 3. 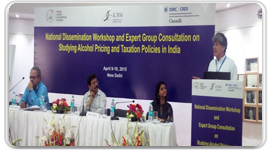 Proposing potential components of multi sectoral alcohol policy for Indian states that considers holistic economic and social factors, including VAW. Panel discussion on “Emerging Perspective from the Global South: Promoting Employment, Education and Skills for Inclusive Development, New Delhi. As the Millennium Development Goals (MDGs) reach their December 2015 deadline, a new set of transformative and universal Sustainable Development Goals (SDGs) will be adopted by world leaders as a part of the Post–2015 Development Agenda at the United Nations General Assembly in September 2015. These new global SDGs will lead policy formulation and funding for the next 15 years. Voices around the world are demanding leadership in 2015 over food security, poverty, climate change and inequality. 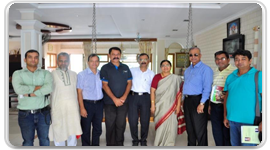 A delegation from the Bangladesh Brick Manufacturers Owners Association (BBMOA) visited Visakhapatnam and Kolkata in June 2015 to seek comprehensive knowledge about Indian Fly Ash brick manufacturing and it use in construction, in order to set up fly ash brick units back home. A diverse set of personnel from Bangladesh came to Visakhapatnam on June 07 for an elaborate discussion on FAL-G brick technology. This was an immediate outcome of the Dhaka roundatable in May this year, wherein this techinology was shared with government and non-govermental stakeholders. 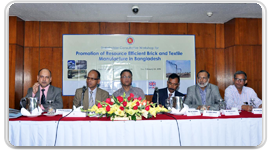 This was an essential milestone towards exploring viable brick technologies that did not use top soil, which is threatening arable land in Bangladesh. Myanmar Research and Capacity Building Programme on Global and Regional Trade Policy” RIS, New Delhi. 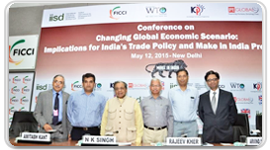 Under the Knowledge partnership programme (KPP), Research and Information System for Developing Countries (RIS) conducted its fourth workshop on Global and Regional Trade Policy on 9-13 June 2015 in New Delhi. 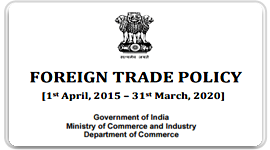 This was the fourth workshop on Trade Policy and Analysis. Twelve Participants from Myanmar and one participant from Manipur participated in the workshop. Among the participants, four were from Ministry of Commerce and two from Ministry of Finance, Government of Myanmar. 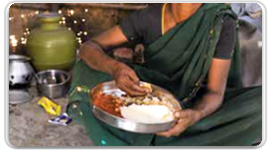 Right to Adequate Food and Nutrition: Building on the Experience of Brazil and India in Dhaka, Bangladesh. The purpose of the session was to provide vital information about trade and investment opportunities in Egypt with the objective to attract higher FDI. 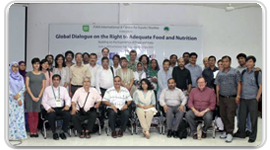 June 2, 2015 witnessed the launch of the first Global Dialogue workshop on Right to Adequate Food and Nutrition: Building on the Experience of Brazil and India in Dhaka, Bangladesh. An ambitious project, Global Dialogues is led by the Centre for Equity Studies (CES), New Delhi with DFID support under the Knowledge Partnership Programme (KPP). Two more such dialogies are planned in Africa later this year. Welcoming the session, Mr. P S Jayaraman, Chairman, TCI Sanmar Chemicals said that that Egypt is in a transition phase and the new government has been following radical economic reforms since 2014. 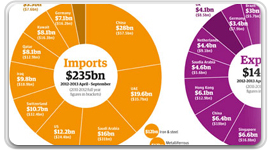 India is the 5th largest importer of Egypt and trade balance is in favour of India. There are 50 Indian companies operating in Egypt with total investment amounting to $3 billion. According to him Egypt is a happening place today and there are many investment opportunities for Indian corporate sector. 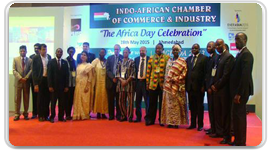 Organised by Indo-African Chambers of Commerce and Industries (IACCI), the Africa Day celebration on May 28th 2015 in Ahmedabad, Gujarat provided an opportunity to KPP to present its achievements in connecting with Africa through knowledge sharing partnership. The African Union (AU), comprising of 53 member states, has brought together the continent of Africa to collectively to address the challenges it has faced, such as armed conflict, climate change, and poverty. 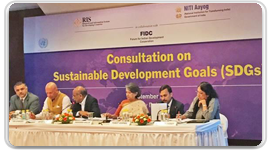 The Commonwealth Secretariat and the International Institute for Sustainable Development (IISD) in collaboration with the Knowledge Partnership Programme of DFID India and IPE Global Pvt. 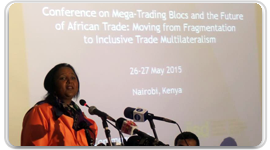 Ltd organised a conference on Mega-Trading Blocs and the Future of African Trade: Moving from Fragmentation to Inclusive Trade Multilateralism on 26-27 May 2015 in Nairobi, Kenya. Thirty five (35) participants attended the conference representing Ministries of Trade and Industry, standard-setting bodies, regional organizations, think-tanks and academia, and the private sector. The broad objectives of this conference were twofold: (i) to assist Sub-Saharan African policymakers and standard-setting bodies assess the policy implications and impact of the rise of mega-trading blocs; and (ii) to explore policy responses and strategies to ensure Africa’s trade success in this changing global trading landscape. The discussion at the conference was held in seven dedicated sessions. Presentations were made by both the Commonwealth Secretariat and invited policymakers and experts. The seminar on ‘Mega-FTAs and Changing Global Economic Scenario: Implications for India’s Trade Policy and Make in India Programme’ was organized IPE Global and DFID in partnership awith International Institute for Sustainable Development (IISD), Geneva, FICCI, New Delhi and Centre for WTO Studies, IIFT, New Delhi with the aim to sensitize Indian policy makers about the challenges and opportunities posed by the upcoming mega FTAs. Inaugurating the conference, Suresh Prabhu, Union minister for Railways said that the upcoming mega FTAs such as TPP and TTIP will impact India's exports significantly and the country needs to make a concerted all-round effort to prepare for and undertake domestic market reforms and push for not only export of manufactures but also of services and agricultural products. 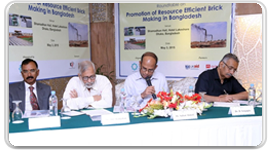 A high level roundtable was organized by Institute for Industrial Productivity (IIP) on 3rd May, 2015 on ‘Promotion of Resource Efficient Brick making in Bangladesh’ through south-south cooperation under the project support by UK Department for International Development (DFID) under its Knowledge Partnership Program (KPP) at Dhaka, Bangladesh. IPE Global is partnering with DFID on this innovative programme. The purpose of KPP is to facilitate transfer of policies, practises and technologies from India to other developing countries. 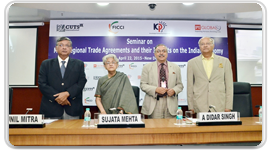 The seminar on ‘Mega Regional Trade Agreements and their Impacts on the Indian Economy’ was organized by IPE global in partnership with CUTS International and FICCI with the aim to disseminate the findings of the study ‘External Preferential Trade Agreements and the Indian Economy (EPTA)’ report carried out by CUTS International. Delivering the welcome address, Mr Pradeep S Mehta, Secretary General, CUTS International pointed out that mega FTAs will create building blocks for higher standards that over time will be transferred to the WTO. In his opening remarks, Mr Sunil Mitra, Director, IPE Global (Team Leader, Knowledge Partnership Programme) noted that India has weak institutions and needs to put in place a strategy in order to align with mega PTAs and respond strategically to its impacts. He also pointed out that the government of India must set up a regulatory policy framework to adapt to the new rules proposed in mega FTAs and work closely with Industry. Sujata Mehta, Secretary (ER), Ministry of External affairs, Government of India expressed the view that India needs to play a more proactive role in the new economic architecture and Indian industry needs to focus on improving product standards, manufacturing and services delivery to remain competitive in the new global market of mega PTAs. Dr A Didar Singh, Secretary General, FICCI who moderated the first session, pointed out that Indian manufacturers should embrace the “Zero Defect, Zero effect” slogan that qualifies the Make in India campaign. 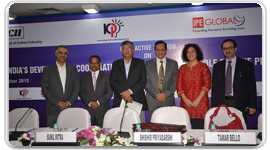 With support from the India Office of the United Kingdom’s Department for International Development under the Knowledge Partnership Programme and IPE Global Limited, CUTS International undertook a project entitled ‘Development Dimensions of the National Foreign Trade Policy of India’. ICRW (International Center for Research on Women) in partnership with IPE Global, supported by Government of UK’s Department for International Development (DFID) under its Knowledge Partnership Programme (KPP) held an Expert Group Consultation on their study findings from the project on ‘Analytic Study on Alcohol and Violence against Women in India’ on April 09, 2015, New Delhi. This paper titled Zero Liquid Discharge published in the Apparel Story, Jan-Feb 2015, is based on work undertaken under a KPP-supported project on Promoting Resource Efficiency across the Vendor Base of Large Private Sector Entities in South Asia. 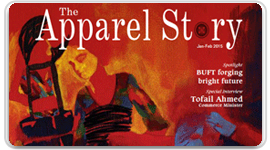 Apparel Story is a well-read and widely circulated publication of the Bangladesh Garment Manufacturers and Exporters Association. More than 10,000 copies are printed and circulated to all its members, government and other development agencies. The firming up of next steps for Adapting Kudumbashree Model in Ethiopia between Kudumbashree and Ethiopia's Ministry of Women, Children and Youth Affairs (MoWCYA) was the highlight of the visit in April 2015. The Bill and Melinda Gates Foundation had organized a Conference on Empowerment and Development with Self-Help Groups on February 10, 2015. The main focus of the workshop was to present how layering of social interventions such as health, on to SHG models can result in positive outcomes. The studies presented highlighted that by and large the evidences obtained after research show positive results for interventions driven through SHGs. Further, training, ongoing capacity building, well established credit linkages and external promoter support act as enabling factors for SHGs to be drivers of development. Several empirical studies were discussed along with their methodology and results. Practitioners also shared experiences from the field and discussed during the open session on how SHGs can be scaled up in a sustainable manner. The conference was attended by more than a 100 participants from civil society organizations, private companies, international institutions such as the World Bank, UN Women, Aga khan Foundation as well as government officials from Bihar, Andhra Pradesh and Ministry of Rural Development (MORD) GOI. 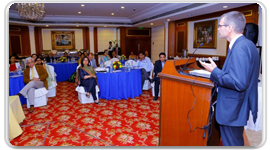 Catalyst Management Services (CMS) Private Limited (Lead Firm) and APMAS in partnership with IPE Global supported by DFID India under its Knowledge Partnership Programme (KPP) held a Workshop on January 20, 2015, in Delhi. The welcome note was delivered by Ms Tamar Bello, Head, Global Partnerships Team, DFID India and Mr. Sunil Mitra, Team Leader, Knowledge Partnership Programme (KPP), IPE Global. 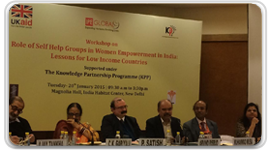 The workshop focused on the research findings of the study ‘understanding SHGs as programme for economic and social empowerment of women in India and LICs’ supported under KPP. Mr. S M Vijayanand, Ministry of Rural Development (MoRD) set the tone of the workshop in his opening remarks. Mr. C S Reddy from APMAS discussed the study findings and highlighted the need for SHG, as the basic unit to be recognized as an institutional mechanism in LICs as India had done through the Reserve Bank of India and NABARD. The workshop included a panel discussion on two important themes: (1) Has the SHG movement contributed to poverty reduction and women empowerment in India? Evidence and gaps and (2) What lessons does the SHG movement hold for low income countries? The panels initiated a lively discussion on the SHG movement and its contribution to women empowerment in India and lessons that can be useful for LICs, especially countries of Sub-Saharan Africa. 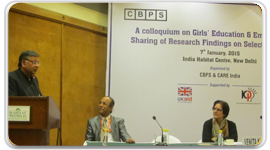 The Centre for Budget and Policy Studies (CBPS) in partnership with CARE India supported by DFID India and IPE Global under its Knowledge Partnership Programme (KPP) held a Colloquium on January 7th 2015, in Delhi. The colloquium focused on research findings of two studies: Residential Schooling for Girls Education and Empowerment: The Missing Links (research conducted by CBPS supported under the Knowledge Partnership Programme) and Special Training Programme - Realities, Issues and Challenges: A Study of Select Districts of Bihar, Gujarat, Odisha and Uttar Pradesh (Conducted by CARE India). The panel on the first study raised questions regarding scaling up of success-stories, learning achievements of JNV students, aspects of social and emotional environment, ability to cope with curriculum, gendered dimension indiscipline and artificial drop-outs. Observations regarding non-functional and non-existing toilets in many KGBVs were also made. The second presentation, by Dr. Suman Sachdeva, CARE India, outlined the review of the curriculum and current status of implementation of Special Training Programme (STP) as mandated by Right to Education in states, where CARE-India’s Girls' Education Programme unit has been active. 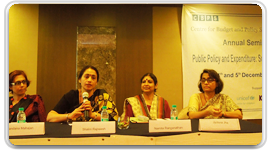 The Centre for Budget and Policy Studies (CBPS) in partnership with DFID and IPE Global under its Knowledge Partnership Programme (KPP) held a Consultative Workshop on December 05th in Bengaluru. The workshop focused on the findings of the KPP supported study on “Residential Schooling Strategies: Impact on Girls’ Education and Empowerment”. 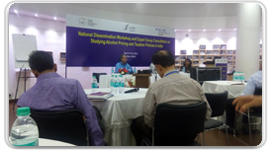 Jyotsna Jha, Director, CBPS gave a brief presentation on the study and highlighted the importance such studies based on empirical data to feed into decision making / policy reforms. This study is a first-of-its-kind research which looks at residential schooling as one of the means to encourage girl child education and building their eventual empowerment in the society. Lamenting the lack of data, key speakers such as Prof. Geeta Menon (independent researcher) and Archana Mehendale (TISS) pointed out the significance of analysing how girl’s in India have been able to benefit through residential schools and highlighted the need for a comprehensive policy on the overall education for girls strategy. 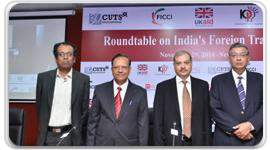 As the new foreign trade policy of India is around the corner, IPE Global Ltd, under its Knowledge Partnership Programme with DFID, in collaboration with CUTS International and FICCI organized a Roundtable on India’s Foreign Trade Policy on 29th November 2014 at FICCI, New Delhi. Mr. Pravir Kumar, Director General of Foreign Trade, Department of Commerce, Government of India was the Chief Guest and key note speaker at the event. 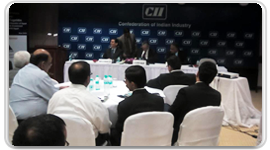 More than 70 participants representing various industry bodies and other stakeholders participated in this Roundtable. The Right to Food is a fundamental human right, yet hunger and under-nutrition remain unacceptably high in low income countries and many developing countries. By 2030, demand for food is expected to grow by 50 per cent as compared to present levels. This calls for the development of a more inclusive and efficient agricultural and food to ensure delivery of greater food and nutrition security for a projected population of nine billion people. 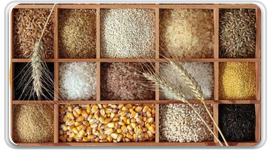 To facilitate decision making and address food security, access to timely, transparent, reliable and accessible information that will improve planning, forecasting of demand and stocking of food at national and global levels is needed. 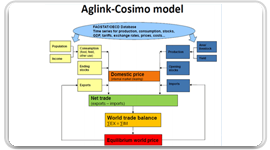 The project supports the development of agricultural outlook reports using globally accepted methodology. The Agricultural Monitoring Information System (AMIS) is structured around market monitoring, analysis, statistics, capacity development and outreach and policy dialogues. 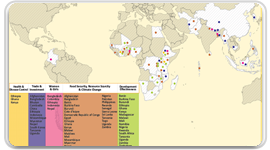 Implementation of this project enabled improved data gathering and analysis and credibility of information, increased transparency and demonstrated commit-ment to address global hunger and nutrition. A workshop was jointly held by IRENA, Asian Development Bank (ADB) and the Center for Innovation, Incubation and Entrepreneurship (CIIE) supported by the Department for International Development (DFID) India on the 15th of June 2014 in Manila, Philippines, as part of the International Off-grid Renewable Energy Conference 2014. Forty three participants from 35 organisations across Asia and Africa participated. The overall aim of the workshop was to provide an opportunity to initiate and facilitate knowledge transfer between various stakeholders in the energy access enterprise development ecosystem in South Asia and Africa. In addition, the focus was to identify opportunities to strengthen enterprise development and, through a collaborative programme, assist in the improvement of regulations, access to finance, facilitation of technology, business model delivery on innovative approaches, and enhancement of skills of energy access entrepreneurs. 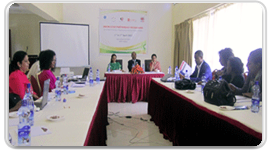 The KPP India – Ethiopia Knowledge Exchange Visit which was held from October 9th to 18th for Ethiopian policymakers’ by the KPP management team focused on the learning’s of Economic Empowerment through Self Help Groups and Women’s Safety. The visit exposed the team of Ethiopian delegates (which consisted of a mixed group comprising of Government Officials, Bankers and representatives from NGOs, SHGs and industry) to the various aspects of financial inclusion and social protection in India. The delegates visited government Ministries’ in New Delhi to get an idea of how flagship programmes have contributed to financial empowerment of women in the country. They also visited Trivandrum and Kochi to study the ground realities of Self Help Groups and understand the integration process of Kudumbashree and local self-government institutions. 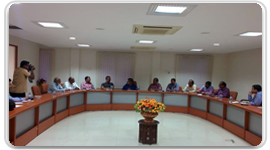 The delegates also interacted with experts working on women’s safety through the use of technology. 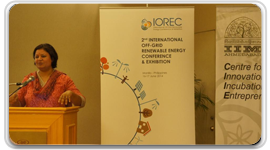 A workshop on ‘Building energy businesses: knowledge sharing sessions with business incubators and entrepreneurs from Asia & Africa’ was organised from 22nd to 27th of September, 2014 by the International Renewable Energy Agency (IRENA) and sponsored by the Department for International Development, Govt. of UK (DFID) through the KPP programme. This knowledge sharing workshop was targeted at energy business incubators and entrepreneurs from South Asia and East Africa. The programme was anchored by the Centre for Innovation Incubation and Entrepreneurship (CIIE) at IIM Ahmedabad and SELCO Incubation Center, two Indian incubator vehicles supporting entrepreneurs in the renewable energy and energy access space. The workshop brought together about 30 participants from 11 business incubators, 2 renewable energy associations and 10 energy enterprises from 8 countries within Africa and Asia - Kenya, Tanzania, Uganda, Egypt, Bangladesh, Myanmar, Nepal and India. 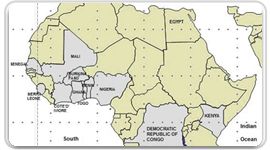 Background of the project: The project, “Dynamics of Pharmaceutical Quality Systems for the Export of Pharmaceuticals from India to Africa”, is a landscape analysis of finished pharmaceutical export from India to Africa. It examines the dynamics of ‘quality’ with respect to market size, risks and gaps, and explores possible strategies to address these risks. In India, the state plays a major role for addressing food and nutrition security through the implementation of several policies and programmes. In 2013, the National Food Security Act was passed in 2013 which makes the Right to Food legally enforceable. The purpose of this project is to share Indian knowledge and innovation in addressing its food and nutrition challenges to stimulate LICs to build stronger national policy frameworks for the same. Debates that arose during India’s journey to the Right to Food and which are globally relevant will be documented and shared in dialogue workshops in Africa and Brazil in early 2015. 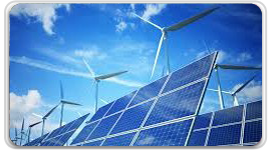 The project contributes towards increasing access to clean renewable ener-gy through entrepreneurship development, by providing knowledge trans-fer opportunities for business incubation centers, industry associations and entrepreneurs in South Asia and Africa. Globally nine per cent of the population – around 1.3 billion people lack access to electricity and 2.7 billion (39 per cent) rely on traditional three stone fires for cooking. Of these, over 95 per cent live in rural areas of South Asia and Sub-Saharan Africa. 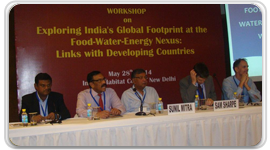 A workshop on “Exploring India’s Footprint at the Food Energy & Water nexus: Link to the Developing Countries” was organized by IPE Global on behalf of DFID under its Knowledge Partnership Program (KPP) on 28th May, 2014. Event was organised to showcase the key findings of the report i.e., on synthesise of current knowledge and evidence on India’s resource footprint related to food, water and energy, in order to assess the global impact and implications of India’s current growth and development paradigm. 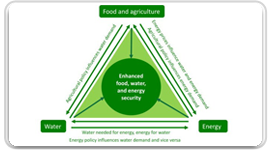 This study highlighted the nexus of Food, water, and energy and there is deep interdependence. 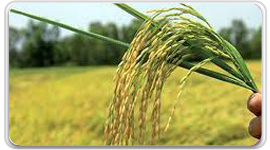 India is the largest groundwater user in the world and about 90 per cent of ground water is used for food production. Energy is a vital input in agriculture for irrigation, harvesting, post harvesting, processing, value addition, storage, and transportation and agriculture accounts for 19% of total electricity consumption and 12% of total diesel consumption in India. 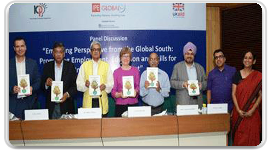 A workshop was organized on 16th April, 2014 on ‘Food and Nutrition Security: building global partnerships through south-south cooperation’ by IPE Global on behalf of DFID under its Knowledge Partnership Program (KPP). The workshop was organized in the context that India is a potentially powerful source of evidence and lessons on addressing food and nutritional security, particularly for low income countries in South Asia and Africa. This perspective was showcase in the report that synthesize the existing evidence on how India has addressed food and nutrition security challenges in recent years, map existing demand for India’s partnership on this issue, and take first steps in identifying promising areas for sharing lessons and good practice with LICs. 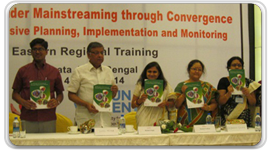 The National Resource Centre for Women (NRCW) released the document – “Good Practices of Convergence on Economic Empowerment of Women” on the 4th of June 2014, during the Eastern Regional Training on “Achieving Gender Mainstreaming through Convergence” organized by National Mission for Empowerment of Women (NMEW), Government of India with support from Asian Development Bank and UN Women. IPE Global Pvt. Ltd. through its Knowledge Partnership Programme (KPP) had supported NMEW in publishing the Good Practices compendium. Mr. Sunil Mitra, Former Secretary, Finance and Revenue, Government of India and Director, IPE Global Pvt. 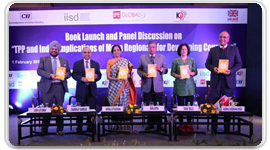 Ltd. who is leading the KPP released the book jointly with Ms. Rashmi Singh, Executive Director, NMEW (National Mission of Empowerment of Women), Ministry of Women and Child Development, among others dignitaries. Ms. Singh in her speech noted the valuable contribution of the KPP team andIPE Global in capturing and crystallizing the Good Practices compendium. The publication captures some of the noteworthy initiatives across the country on gender equality and women’s empowerment through gender mainstreaming and highlights various case studies such as Self-Employed Women’s Association – SEWA Bharat, Economic Empowerment of Women– Kudumbashree Experience, Mahila Arthik Vikas Mahamandal (MAVIM), Path for Women’s development: Indira Kranthi Patham Society for Elimination of Rural Poverty – SERP, Empowering Women – A Case Study of Meadow (MYRADA), Concept of Women–led Integrated Natural Resource Management Programme: PRADAN, Priyadarshini, Women’s Empowerment and Livelihood Programme in the Mid-Gangetic Plains – NABARD, Mission Mangalam – Gujarat Livelihood Promotion Company Ltd.
CII India-Africa Conclave held during 9-11 March, 2014 in which three studies being carried out under the KPP were showcased and presented at the conclave drawing huge response from Ambassadors of various Sub-Saharan and East African countries and officials from both the Indian and African side. The studies which were presented in the conclave were as follows: "India's Development Cooperation Initiatives- The Road Ahead" - this study is being carried out by CII and Mr. Shishir Priyadarshi, Director, WTO, Geneva, under the KPP and was discussed on the first day of the conclave. KPP is supporting development and implementation of a unique mobile application which integrates crowd-sourced information on women's safety and infrastructure / geographic location. From the commencement of the project in July 2013, Active Learning Solutions (ALS) has conducted over 3000 safety audits and has collected data on police station, police stations, hospitals, and transport options across NCR. Information that has been available in the public domain has been properly mapped and is now available on the safety app that was launched on 13th November 2013 at the British Council. The app, is now available for free to Android and iPhone users. Further audits have also been conducted in low income communities with the help of Jagori and other civil society organisations in the NCR region. 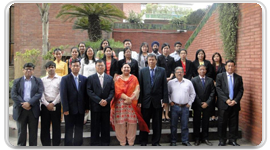 KPP - India – Nepal Knowledge Exchange Visit 10th – 17th September 2013 Knowledge Exchange – Nepal Government Officials exposure visit to India was organized by the KPP Management team to share learnings from the Mahatma Gandhi National Rural Employment Guarantee Scheme. 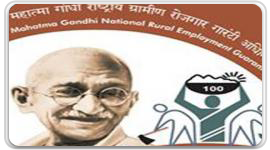 The visit was organized from the 10th to 17th September 2013 to understand the various steps in implementing MGNREGS and the practical challenges which are faced on ground by the local bodies. The Joint Secretary at the Ministry of Federal Affairs and Local Development (MoFALD) of the Government of Nepal was a part of the team who is presently drafting the livelihood programme in the five districts of Nepal. The visit culminated with the delegates sharing the key learnings from the experience they gained in Delhi and Tamil Nadu by interacting with officials, beneficiaries and partners and explored and discussed areas which could be replicated in the Nepal context. Nepal will be implementing a similar livelihood programme in its five districts.